Cedar’s top notch athletic program combines a robust offering of team sports – from baseball, basketball and football to hockey, lacrosse and soccer – designed to help our campers improve their skills, develop good sportsmanship, compete in inter-camps and tournament play all while having fun. Led by our tremendous Head Coach Jon Fahey (Head Coach of Brooks School) and his hard-working staff, baseball is one of Cedar's most popular activities. 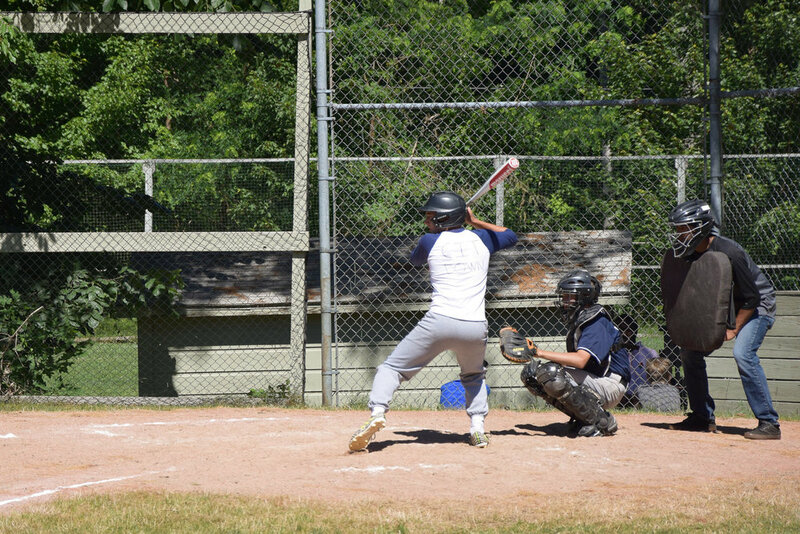 Cedar's baseball facilities include 2 fields ranging in size from little league to high school, as well as four batting cages and a number of other hitting devices to groove your swing. The Cedar Rec. Hall with its’ beautiful hard wood floor gym is the best basketball facility. In total, Cedar has 6 basketball courts, with adjustable rims on many of the glass backboards. Cedar hosts the biggest tournament around each year with over 20 teams coming to participate in a two-day affair. With two fields, complete with goal posts, flag football is a mainstay at Cedar. Whether you’re looking for a simple game of touch or preparing for High School pigskin, our football program offers a wide array of drills and games to appeal to everyone, taught by former collegiate players and coaches. Whether you are just learning to skate or an elite hockey player, Cedar offers plenty of top-notch instruction for all ages and abilities. We play both street and roller hockey, and many boys learn to rollerblade right here at camp! We have two state-of-the-art roller hockey rinks, both specially surfaced with a roller hockey finish, and one complete with lights for night games. Learn to shoot and score. From novices to our 15-year-old tournament team, Cedar lacrosse has something for everyone. Cedar hosts the area’s biggest lacrosse tournament on its full size lakeside field. Special clinics are run annualy, ranging from Bates Head Coach Pete Lasagna to former Team USA players. Cedar's main soccer field is a lighted NCAA regulation field. A supply of different sized fields and goals and a dynamic teaching program combine to make Cedar soccer great for the beginner or for the travel soccer player. Past special guest stars have included former National team coaches Bob Bradley (US) and Paul Brown (Jamaica), former US Goalie Jeff Duback and more! Cedar has two beach courts that are great for volleyball and newcomb. Our younger campers play newcomb, developing catching and throwing skills while working in a team setting. As the boys get older volleyball is introduced, where they learn to dig, set, serve and slam!